Deal Book. Eurasian Natural Resources Corporation PLC (ENRC) is in a bitter custody battle with a trio of the founding shareholders who own 45% of the stock between them. They have the backing of the State Property & Privatisation Committee of Ministry of Finance of Kazakhstan which owns another 12% of ENRC, and they want to “buy” back the rest of the company from “uncle” Kazakhmys PLC who owns 26% of the stock and is also a major copper and other natural resources miner and electrical power producer in Kazakhstan since 1930 (Reuters, May 31, 2013, Exclusive: Founders seek more time for ENRC bid – sources). To sweeten the deal, the Kazakh government has stock in Kazakhmys PLC (as well as 12% of ENRC, as above) and – in lieu of money – has offered to tender its stock in Kazakhmys along with cash from the founders and their backers in order to buy in all of the outstanding shares. The specifics of the offer are 175 pence in cash plus 0.231 of a Kazakhmys share from the Kazakh government for each ENRC share, which amounts to about 251 pence in contrast to ENRC’s closing price of 239 pence last Friday (ibid, Reuters). However, in our view, the deal is still a “cheap shot” and undervalues the company (ENRC) significantly to what it would be worth to anyone who could actually produce its demonstrated “values” and no doubt that’s what the new owners have in mind. We can say this with confidence because the demonstrated Risk Price (SF) of the ADR is $3.90 and twice the offer of 251 pence per share which is worth $3.82 per share or $1.91 for one ADR certificate worth 1/2 share. Please see Exhibit 1 below. There are other players in the game, too, but not enough to score. Mr. Suleiman (Suleyman) Kerimov is said to own about 3% of the stock; and the four investment firms: BlackRock Incorporated of New York; SKAGEN Fondene of Stavanger, Norway; GIC Asset Management, a sovereign wealth fund based in Singapore; and Capital Research & Management, Los Angeles, California, each own about 1% of the stock for investments that would be currently valued at $50 million each, and down significantly from about $150 million last year (please see Exhibit 1 below). The remaining shareholders of 10% of the stock would also lose about $1 billion on the deal, and there are no “Lawyers Without Portfolio” (LWPs) to represent them and agitate for the creation of “greater shareholder value” and “shopping the company around”; please see our recent Post, (B)(N) SFD Smithfield Foods Incorporated, May 29, 2013. If Kazakhmys PLC throws its 26% interest into the deal, then more than 75% of the shares will be in the deal and the company can be delisted, and the remaining shareholders will get what they get, and at least $9 billion of “shareholder value ” has just “vanished” between June of last year and today. The company is also operating at a loss of about ($600 million) on sales of $6 billion but is anticipating to pay dividends of $145 million to its shareholders for a current yield of 3% ($0.028 per share semi-annually on the ADR). Its competitors are much larger; BHP Billiton Limited ($60 billion), Rio Tinto PLC ($50 billion), and Vale SA ($47 billion). But we would think that a company that mines copper in the Katanga province of the Congo (please see the illustration above) is a lot bigger than it looks and should fetch more than just one year’s revenue. Just saying. Eurasian Natural Resources Corporation PLC is a diversified natural resources company performing integrated mining, processing, power generation, logistics and marketing operations. The ADRs (American Depository Receipts) are thinly traded in New York in very small fractions of the traded stock in ENRC in London, England; one ADR is equivalent to 1/2 share of ENRC which trade in pence and, therefore, to avoid an arbitrage opportunity, the New York ADR price must also reflect currency exchange values as well as the much greater trading volume in London. From the Company: Eurasian Natural Resources Corporation PLC (ENRC) is a diversified natural resources company, and engages in mining, processing, energy, logistical, and marketing operations worldwide. The company operates through six segments: Ferroalloys, Iron Ore, Alumina and Aluminium, Other Non-ferrous, Energy, and Logistics. The Ferroalloys segment extracts and sells chrome ores, as well as produces ferroalloys from chromium and manganese ores. It offers high-, medium-, and low-carbon ferrochrome; and other alloys, including ferrosilicochrome and ferrosilicomanganese. This segment sells its ferroalloys to steel producers, third party ferroalloy producers, and the chemical industry. The Iron Ore segment engages in the exploration, extraction, processing, and manufacture of iron ore products. It produces and sells iron ore concentrate and pellets primarily to steel producers. The Alumina and Aluminium segment is involved in the extraction and processing of bauxite and limestone; and the smelting of alumina and aluminum. It sells alumina to aluminum producers. 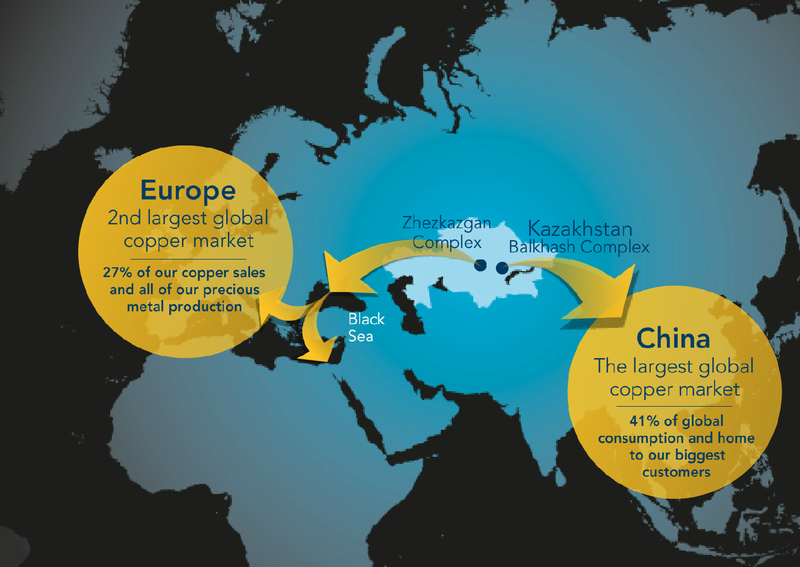 The Other Non-ferrous segment engages in the exploration and extraction, processing, and manufacture of copper and cobalt products; the exploration of other minerals, including coal, bauxite, platinum, and fluorspar in Africa; and trucking and logistics operations. The Energy segment is involved in coal mining and processing to produce coke and semi-coke products; and power generation in the Republic of Kazakhstan. The Logistics segment provides transportation and logistics services. Its operations include freight forwarding, wagon repair services, railway construction and repair services, and trucking. This segment also operates a railway transfer and reloading terminal on the Kazakhstan-China border. 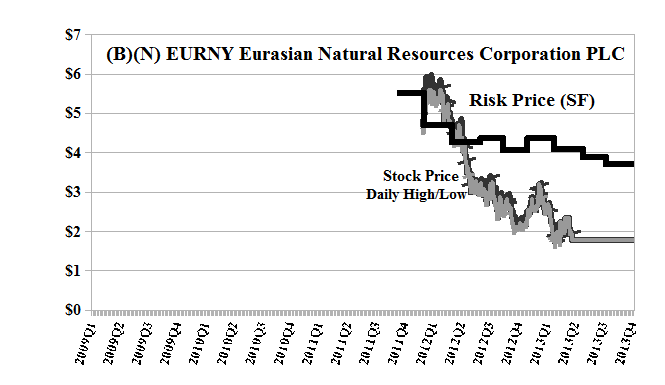 Eurasian Natural Resources Corporation PLC has 80,000 employees and is headquartered in London, England.